This was a virtually unnoticed album from soon to be chart superstars Wet Wet Wet. It was released after their fist album, before they had become really famous. It is only seven tracks in length and results from sessions in Memphis with legendary producer Willie Mitchell (best known for his work with Al Green and Ann Peebles). Quite how this relatively unknown Scottish band managed to get such a gig is unclear. They definitely struck lucky, although the album slipped completely under the radar. The tracks are mainly Memphis-style re-workings of ones from the debut album, "Popped In Souled Out". They are good, too, and personally I prefer many of them to the originals, but then I am a huge Stax fan. "I Don't Believe", as with all the material is done in a warmer, more laid-back and soulful fashion, less sharp and poppy. The sound is a bit more understated, but is more bassy and rich at the same time. The track is also given a vaguely reggae beat (maybe due to its lyrical references to Linton Kwesi Johnson's "Sonny's Lettah"). 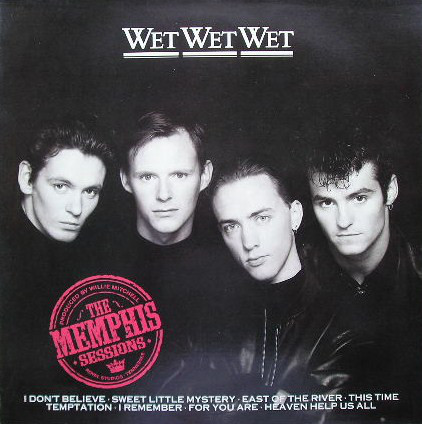 "Sweet Little Mystery" is slowed down somewhat and Marti Pellow's gorgeous vocal is even more enticingly appealing. Booker T-style organ backs the version and while it doesn't have the sheer pop joy of the original, it does have a lush, soul feeling about it. "East Of The River" has some delicious Memphis horns blasting all over it, like a Southside Johny track. The backing is so powerful that it almost drowns out Pellow, not quite, though, it would take quite a lot to do that. "This Time" is a slow ballad with a Prince-esque vocal in places. It has a late-night cocktail bar ambience to it. "Temptation" has always been my favourite Wet Wet Wet song. 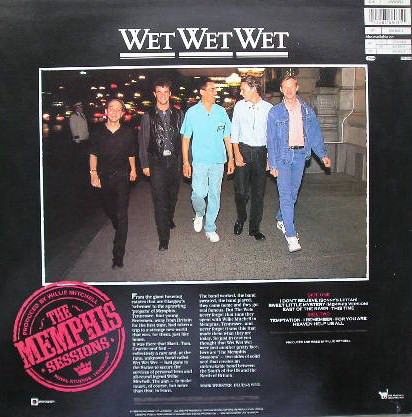 Here is it slightly speeded up and given some tax horns and melodic Memphis guitar sound. While it is a good version, it loses a little of the grandiose pop majesty of the original. "I Remember" has some captivating percussion sounds and seductive horns. "For You Are" is another late night slow burner, while the cover of Stevie Wonder's "Heaven Help Us All" is uplifting and credible. This was an impressive, underrated album that is worth checking out. It is certainly not essential, but worth half an hour of your time.